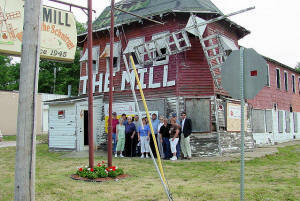 City of Lincoln, Logan County and Route 66 tourism officials gathered Monday morning for what is a turning day in the future of The Mill. The Route 66 Heritage Association of Logan County formed last fall when the property was going to be confiscated for its hazardous condition and the building was to be demolished. The new organization stepped up with plans to preserve, renovate and make the popular former Route 66 landmark into a desirable attraction once again. The city of Lincoln Fire Department was assisting with the wet demolition of a portion of the building around the backside of the building Monday morning.